This newly updated handbook from The ePolicy Institute and EdgeWave, is an invaluable tool for IT and HR professionals who need to establish rules and guidelines for electronic communications at their organizations. 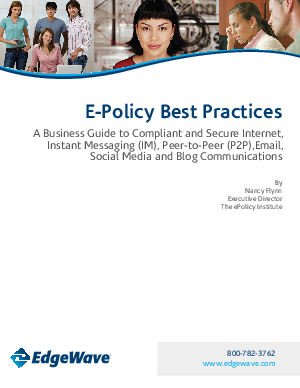 This clear and thorough document gives you the dos and don'ts of e-policy best practices and covers the electronic activities that can seriously affect your organization including the Internet, Instant Messaging (IM), Peer-to-Peer (P2P), email, social media and blogs. These tested and proven guidelines will help you begin writing the policies that best support your organization's business goals. Discover how accurate and detailed policies are part of an overall security strategy that includes comprehensive Internet and email filtering to protect your networks and employees from emerging threats. Don't wait until your employees or networks have been compromised, start building a foundation for secure communication throughout your organization with this valuable handbook.